Peter Riedler was born in Graz, Austria in 1969. He is married and has two daughters. After finishing secondary school he studied law at the University of Graz. From the University of Graz he holds a Doctor Degree, additionally he studied International Relations at the Bologna Center of the Johns Hopkins University and European Law at the University of Wales, College of Cardiff. After having worked for the World University Service, based at the Institute for International Law in Graz, he moved to Brussels, where he served as assistant to Members of the European Parliament. From 1997-2002 he was a personal advisor of the Regional Minister for Economic Affairs, in Graz, Austria, and from 2002-2007 Economic Advisor of the Federal Chancellor of Austria. From 2007-2011 he worked for AVL List in Graz, the worldwide largest privately owned company for the development of combustion engines. From 2011 on Peter Riedler has been Vice Rector for Finance, Resources and the location development and is lecturing at the Institute of Corporate Leadership and Entrepreneurship of the University of Graz. He is a member of the Austrian Fiscal Advisory Council and holds and has held numerous positions in Supervisory Boards, such as in the healthcare company Kages, the business incubator center Science Park, and CBmed, a Graz based competence center on biomarker research. 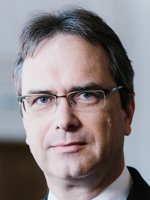 Peter Riedler is a member of the board of directors of EcoAustria, Institute for Economic Research, Vienna, and the RIS3 expert group of the European University Association.